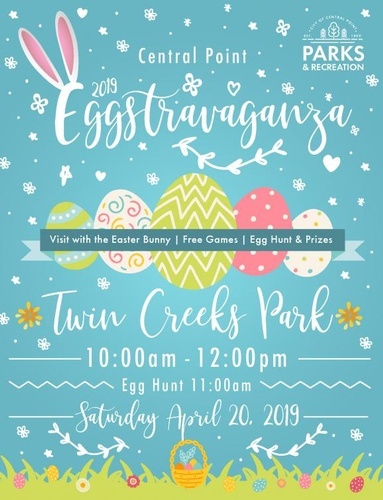 Join us for the Central Point Eggstravaganza! Come see the Easter Bunny!! and join in on the Easter Egg Hunt! Free games and activities will begin at 10:00 am for you and your family. Bring your camera and visit with Bunny. Food will be available for purchase. The Egg Hunt will begin at 11:00 sharp, don't be late! The Egg Hunt is split up into three age groups for kids 9 and under. Parents can assist kids ages 3 and under in a specially marked section only, in all other sections parents must stay outside of the marked area for everyone's safety. Please specify a meeting place with your child for after the egg hunt.